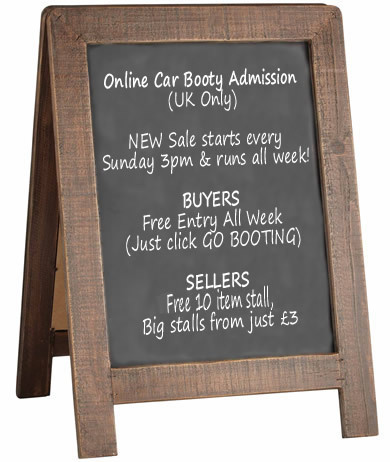 The Online Car Boot Sale runs all week and NEW stalls start every Sunday at 3pm. Click GO BOOTING above to view the current sale. We are a great alternative to Ebay and our army of online car booters is getting bigger every day! If you wish to buy second hand goods or indeed find bargain priced new items, simply click GO BOOTING to enter the Online Car Boot Sale where you will see aisles of virtual stalls. It has all the excitement of a buying at a real UK car boot sale.. You can chat to sellers about their items and maybe try a bit of online haggling using our built in messaging system. Buying online in the UK has never been easier.. We can't stress enough just how big your chance is of finding a bargain. Just like at a real car boot sale, the sale is timed and NEW stalls all commence at 3pm Sundays. You can even pick which aisle you wish to start on so if you're quick, crafty and enjoy a treasure hunt.. This is the place for you. We are one of the biggest car boot sales online and one of the very best bargain hunting websites there is! Each Seller gets their own virtual paste table and can set up a stall in seconds! Simply upload photos of items and you're pretty much done. If you're looking for alternatives to Ebay, Online Car Booty is the place to make money online.. We don't charge 'Final Value Fees' so we're a great alternative to other selling sites / UK classifieds. Each Seller get's a FREE Tombola ticket. Just click SELLER to book your stall. Remember, our paste tables are very sturdy.. You can even advertise used cars for sale. Simply book your virtual stall through the SELL menu above and then go to the Stall Setup page.. It's a piece of cake. Try us today and if you have an Android device, make sure you download our car boot sale app. Looking for a FREE car boot sale for charity sellers ? Look no further.. If you wish to sell goods for charity at our online car boot fair, simply change your accepted payment method to 'Just Giving' and we will direct your buyers payments to a Just Giving donation page you have previously set up. You can claim a FREE 100 item stall through the SELLER page once you have done this. Selling for charity at our car boot sale online and by using our boot sale app, we think you'll find us one of the best and unique ways to raise money online for charity. Afterall, we're dryer than any outdoor car boot sale and busier than the average indoor car boot sale! Search Google Play Store for 'Online Car Booty' or scan the QR code to download the car boot sale app..
Where is my nearest car boot fair ? Car boot sales near me ? Need a car boot sale directory ? Find outdoor and indoor car boot sales right here..
Snooker and pool accessories, pool cue sales, online pool coaching & much more at..
After visiting our online car boot fair, you can help our site get even better by clicking on the following ad. Every click gives us a few pennies which we put towards upgrading the website.